I bought Etrian Mystery Dungeon on release, having seen nothing about the game but a fairly vague trailer. These were two tastes I already knew I liked: the massive Wizardry-style Etrian Odyssey dungeon-crawler RPG combined with the smaller-scale-- but far less forgiving-- roguelike Mystery Dungeon. What I expected was a Mystery Dungeon game with an Etrian skin and a few of its gameplay trappings, like character classes. What I got was something much more ambitious: a game that combines the two styles directly, creating a two-headed monster. It can be overwhelming to handle, at first, but as the game begins to settle, the developer’s purpose becomes clear. The games haven’t been rammed together carelessly: rather, the developers (Mystery Dungeon’s Spike/Chunsoft, supervised by Atlus) have tied the complexities of each game directly into each other, creating a balled-up web of systems and mechanics that will bite off your finger if you pull carelessly from the wrong spot. 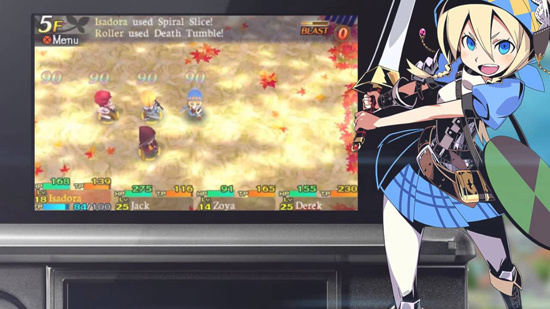 The game starts like any Etrian Odyssey: you create a team of adventurers and send them around town, outfitting them with weapons and armor and chatting up the locals. When it comes time to go into the dungeon, however, things start to change. 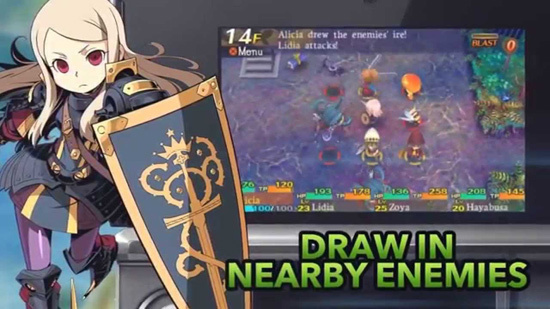 The map-drawing, first-person crawl of previous Etrian titles has been discarded in favor of the randomly-generated dungeons (hence mystery) and overhead roguelike crawl of Mystery Dungeon. The two interfaces have effectively been combined: Mystery Dungeon’s core gameplay with Etrian’s town, character classes and skills. Very few systems from either game have actually been cut: especially when working in the menus, it feels you’re like playing both of them at the same time. The combination of most of the mechanics of both games at once can be overwhelming: hours in, the game is still revealing new systems of its own and giving quick tutorials for their use. At first controlling a party of four, step-by-step, with the ability to swap between any of the four characters whenever you like, can feel unwieldy. Your AI-controlled partners are often unhelpful in this regard. Their first instinct is to run towards danger, even enemies the game specifically instructs you to run like hell from; my brave, combat-useless Medic once broke from the party to dash at a boss two rooms away. They’re also given to burn all their TP on the most minor enemies unless you specifically tell them to stop using that spell forever. However, after a few dungeon crawls the new arrangement gets comfortable, and you realize that all these options give you power. 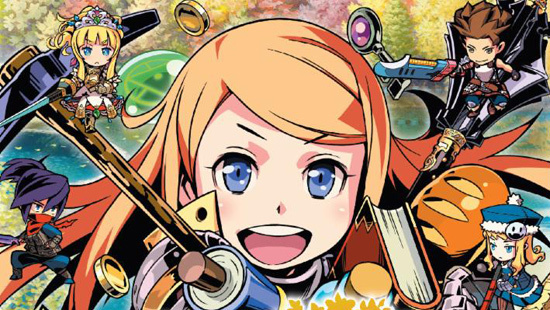 Etrian’s character classes, the four-player party, and the ability to play any one of those characters as you choose add welcome variety (and several safety nets) to the typically harsh Mystery Dungeon. On the other end, there’s also a character class based directly on the Mystery Dungeon protagonist Shiren, offering, as in that game, great versatility and low defense. In the very same way as Etrian mixes up Mystery Dungeon, Mystery Dungeon mixes up Etrian. The game’s great abundance of magical items and scrolls, usable by any character, make every character extremely powerful and versatile. Etrian has similar useful items, but Mystery Dungeon hands them out like candy, and they have powerful effects like slowing the enemy or sealing away their skills. Especially in the tough boss battles, it’s often the judicious use of those items, more than just good gear or stats, that will win the fight. Depending on what you’re carrying, much of the range of magic is available to any character. Mystery Dungeon also traditionally features a heavy penalty for dying. In the classic Shiren series, the player loses all of their items and money upon dying. That’s right; if you want to keep your sword in Shiren you have to beat the game. Though Etrian is a tough game itself, its reliance on gear means that this would be too severe of a punishment. Instead, the “less severe” punishment is incredibly evil in its own way: each party member loses a random equipped item. It could be that favorite sword, or it could just be your shoes. In any case, you’ll start to hoard equipment in the storehouse that you’d normally sell in Etrian, in case of disaster. With some care and foresight, it’s significantly harder to get killed in Etrian Dungeon than in other Mystery Dungeon games, in which it can be outright inevitable with enough bad rolls of the die. Healing is abundantly available, TP refills are constant, and if you really think you’re in a situation you can’t win, you can always use an Adriane Strand to pop back up to town. Your greatest fear is often hunger. Even so, due to the whims of random chance, dying is still sometimes just a thing that happens in Etrian Dungeon. Though it’s statistically unlikely, you can get teleported into a room, put to sleep, poisoned and beaten to death with a single step. It’s best not to get too attached to a particular piece of equipment: the game certainly isn’t. The game knows this is harsh. The first dialogue in the game is a warning framed as a joke: a tour group of would-be adventurers turn tail and run when a guide tells them that they could lose their items. “Kind of like you, huh, player?” the game silently taunts. Things gets more complicated, and they get riskier. Even with the systems of two games piled on top of each other as they are here, the game adds more systems to bring back some of that pressure that was missing. After all, it’s still hard to fail, and we can’t have that here in Mystery Dungeon! 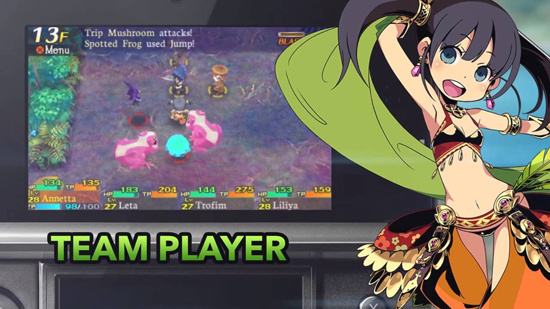 Etrian Mystery Dungeon is playing a long game: it may be easier than other Mystery Dungeon games (and harder than other Etrian games), but in order to rebalance the tension, it raises the stakes. Your town, Aslarga, is perpetually on the edge of being devastated by a DOE (this game’s version of the Etrian FOE), an abnormal monster who’s often more powerful than your party. Not only are you paying to rebuild the town with your own money, it’s also your job to protect it from the DOE. Unlike in other Etrian games, you can’t just avoid the DOE: it is moving towards town and the results of it making its way up are catastrophic. If the monster attacks the town, the people will evacuate, you’ll lose access to the stores for a time, and you will lose your precious investments in the town. This is a much more devastating loss than merely losing an item or two. In the fight against the DOE, literally everything you have worked for in the game is on the line. I know you’re thinking “I’ll just reload if I screw up!”, so be assured that the game saves at the very moment of your death so as to keep you from cheating. Like with Resetti in Animal Crossing, the game assumes you were trying to avoid death if you turn off your system, so it counts it as a failure and you lose everything anyway. (Do not play this game on a low charge!!) Embrace being forced to commit to your choices: it’s all the more reason to stay smart, to never play careless, and to never get bored. If you’re interested in a game that puts a lot on the line and hits back hard, ala the Souls series... well, you might be busy with Bloodborne or Monster Hunter right now. But don’t overlook Etrian Mystery Dungeon! It’s that good, heavy stuff. Just make sure you’re willing to give back what it asks of you.